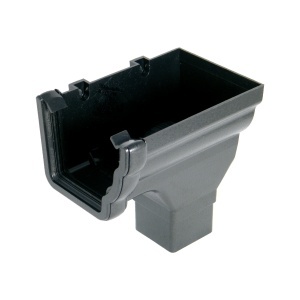 FloPlast Cast Iron Effect Niagara Ogee Gutter Right Hand Stopend Outlet. Please note: A Cast Iron Effect Square to Round downpipe adaptor MUST be used with this fitting to enable the Round Cast Iron Effect Downpipe to be connected. The Square Cast Iron Effect Downpipe does not need this adaptor.